In the finished desserts category, you will find products that are pre-baked and frozen. 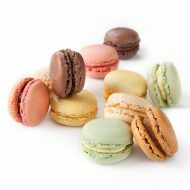 Some of these include French macaroons that are tasty, colorful and can be served alone, or placed alongside other desserts. There are several flavors and options available to chefs and bakers, ranging from raspberry flavor, chocolate flavor to lemon and coffee flavor. All frozen pastry items must ship FedEx next day. Email info@divinespecialties.com for a quote.